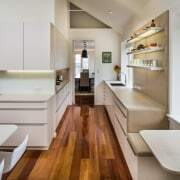 ​​​​​​​A new light-toned kitchen sits in a light-filled space, in this design rethink, part of a wider renovation of a 1900s cottage by Damian Hannah of German Kitchens. 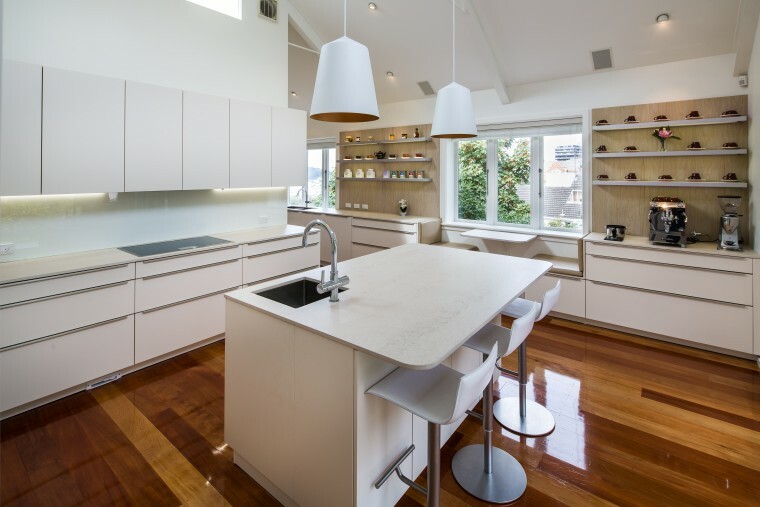 A designer gets the most out of a kitchen by including what’s achievable from an owner’s wish list while avoiding what might not work so well in the final out-come. The owners are the winners, as this Damian Hannah kitchen reflects. 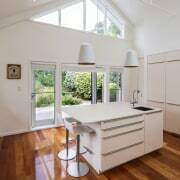 “The owners – parents of a growing family – were renovating their 1900s Wellington villa and wanted to replace the outdated kitchen and linked office with a larger, more welcoming kitchen and possibly a scullery,” says Hannah. 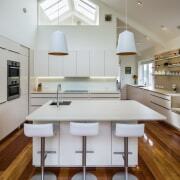 The kitchen designer looked at the overall space and considered the scullery option. 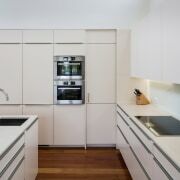 ​​​​​​​Two sinks, myriad benchtops and plenty of space means two chefs can use this kitchen, by German Kitchens, at the same time. Instead, Hannah transformed the outdated office into an ancillary kitchen area – complete with second sink and dishwasher – avoiding the need for an obstructive, walled-off scullery. 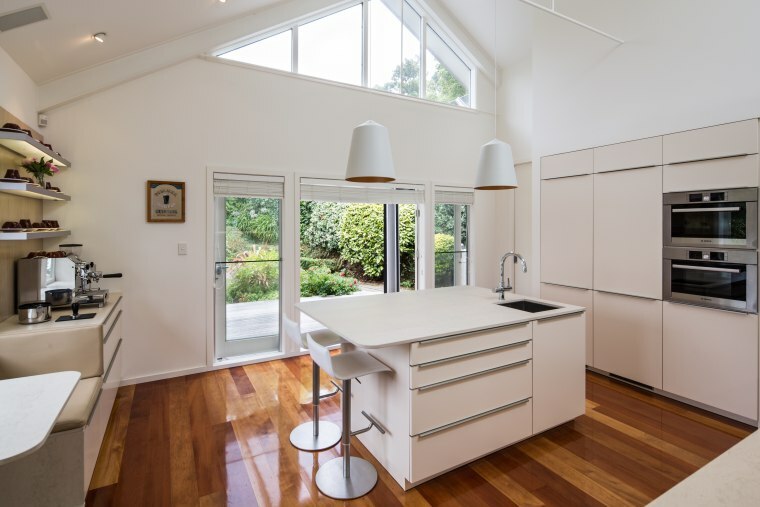 This opened the space up, retained connection to the living areas and avoided reducing natural light that would have resulted from a dedicated scullery. 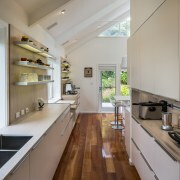 It also allowed the designer to include a long benchtop running right along the kitchen. The latter also offers a casual office space that’s more central for keeping an eye on the kids. 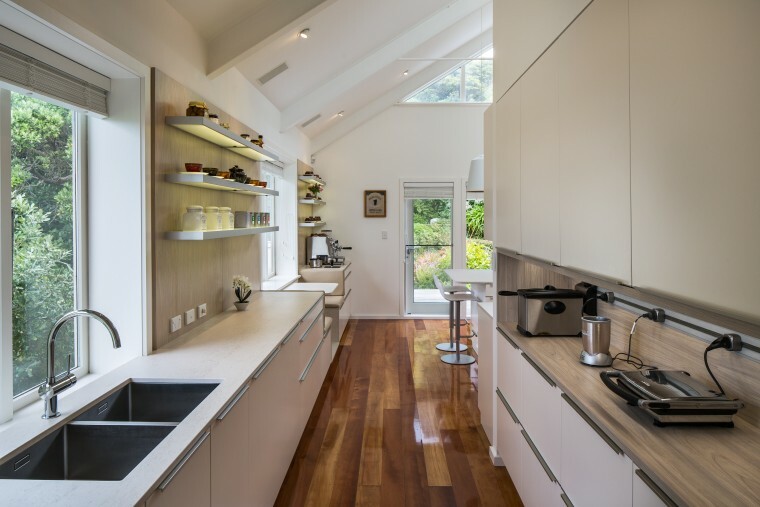 ​​​​​​​Originally an office, now part of the kitchen, this narrow through area to the living spaces includes shallow cabinetry. 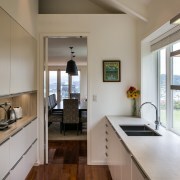 A second sink in this area is positioned in front of the window to optimise natural light on the work surface and also so the chef can prep and take in the views at the same time. The project is by designer Damian Hannah. 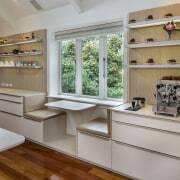 Hannah designed shallow cabinetry for the new rear kitchen space – maximising storage in this area. He also introduced a handy electrical track that allows small, on-bench appliances to be permanently plugged in ready for use.